The City of Cleveland added 15 new emergency medical technicians (EMT) and paramedics to help serve neighborhood residents The new EMT staff is part of Mayor Frank G. Jackson’s effort to enhance the quality of life in Cleveland neighborhoods by maintaining staffing levels and reducing emergency response times. “The people of Cleveland expect and deserve the best trained and equipped emergency medical personnel and this graduating class is reflective of the training they received,” said Mayor Jackson. 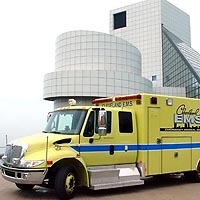 The City of Cleveland’s Division of Emergency Medical Service, as a direct result of Mayor Frank G. Jackson’s enhanced budget and the passage of Issue 32, has increased the number of ambulances operating in the City to 25 during the day and 21 at night. The additional units are part of the Mayor’s commitment to improving the quality of life in Cleveland neighborhoods by reducing emergency response times. Cleveland EMS is staffed with, on average, 333 professionals who run 25 state-of-the-art advanced life support ambulances handling over 116,000+ emergency calls annually. The dispatch center is now run locally with certified Emergency Medical Dispatchers trained on a Computer Aided Dispatching system which allows for call prioritizing, pre-arrival instructions, and the tracking of ambulances and support vehicles. The Division’s emergency medical personnel receive extensive education, training, and performance evaluations to ensure that Cleveland's citizens and visitors receive quality pre-hospital medical care in times of need. Cleveland's Emergency Medical Service (EMS) Division was one of the country's first. Prior to its formation, police cars were used for emergency hospital transportation. A federal grant enabled the City to purchase a dozen ambulances and train 120 Emergency Medical Technicians (EMT's). EMS Medic 9 (based out of University Hospitals at that time) responded to its first call at 9:00 am on October 13th, 1975. 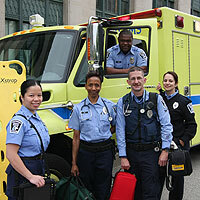 Cleveland EMS handled over 80,000 emergency calls that year. At that time, a central dispatch center received nationwide 911 calls which were then routed to the appropriate cities. Advances in medicine, technology, education and training allowed the division to make major improvements. Public awareness grew as people recognized that EMS services were increasing survival rates for the critically sick and injured. We are committed to improving the quality of life in the City of Cleveland by maintaining the highest ethical and professional standards of pre-hospital care, treating our patients with dignity and respect, and caring for each patient as if they were a member of our own family.